Get 'em while they're hot: new magnets from Skeese Greets! On the fridge in the office or on the locker at school, these magnets will get the job done in style. 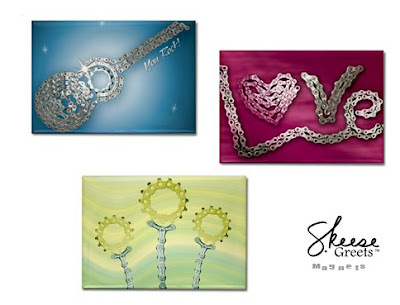 Each magnet is designed using old bicycle chains to form the shape of a guitar, flowers & LOVE. It's a 2.125" x 3.125" magnet with a flat, strong magnetic back, metal shell and Mylar/UV protecting cover.